A beautifully maintained and lovingly owned Blue convertible with standard black retractable electric roof, fully serviced for the past 8 years by Rolls Royce/Bentley Specialist Silver Lady, Alma Road, Bournemouth, The car has added extras including a mahogany steering wheel and matching mahogany gear knob, stainless steel insert light trims and stainless steel fender and radiator cover, twin exhaust as opposed to the standard single exhaust. The car is fully functional and is used as an everyday vehicle by myself. 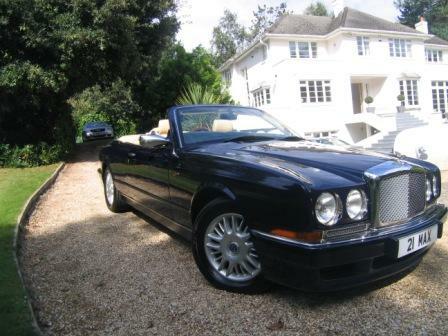 The car is only being sold as I am upgrading to a new Phantom Convertible Drop Head. 115,000 miles on the clock and taxed for 12 months and MOT until March 2011. 21 MAx no plate NOT included in sale.